Russian borscht with beef and sour cream. Russian pirozhki made with onion, mushroom, meat and rice stuffing. 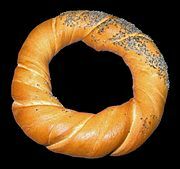 Vatrushka is a Russian/Eastern European pastry with a ring of dough and tvorog in the middle. Kvass is a russian bread-based drink and an ingredient in many soups (light kind). Pelmeni is russian national dish , a type of dumpling consisting of a filling that is wrapped in thin unleavened dough. Solyanka is a thick, spicy and sour soup. Frozen pre-packaged blintzes may be fried. Beef Stroganoff is a russian dish of sautéed pieces of beef served in a sauce with sour cream. Example of Beef Stroganoff recipe. Varenyky are square- or crescent-shaped dumplings of unleavened dough, stuffed with sauerkraut, cheese, mashed potatoes, meat, hard-boiled eggs with a fruit filling. Bubliks are made from yeast-leavened wheat dough that commonly contains milk, butter, and egg whites and is rather sweet.